Philip Spooner gives us all hope for a better, and more equal, future. The father of four tells the world that he didn’t raise his three straight sons to be any better or more deserving of their rights, benefits and protections under the law than his gay son. 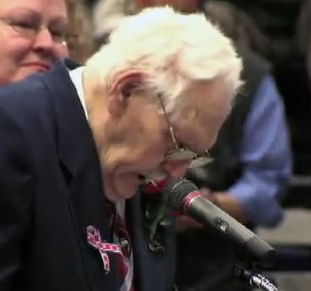 We honestly got choked up to hear Mr. Spooner lecture those listening about why our country entered World War II – to defend the equal rights of all. When an octogenarian WW2 veteran offers you sage wisdom on what it means to be an American, it’s usually best to listen to what he has to say. “Everybody is supposed to be equal in equality.” Agreed. That’s kind of a critical part, after all.